A new week has just begun and I’m starting off right (or at least I hope I am). For this blog post I’m featuring products from my friends at Image Essentials and Native Urban. I really enjoyed photographing this scene because it was rather goofy and I think that’s something I haven’t touched on recently so that’s what I’m doing with the help of the pose set that is being featured here today. 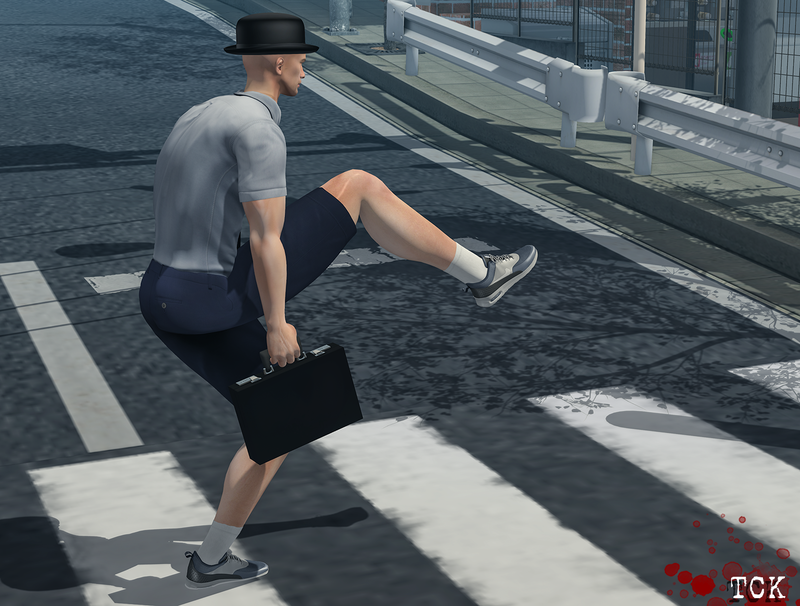 Image Essentials has released a Monty Python inspired set called “Ministry of Silly Walks” and if you’ve never seen the skit then here is a LINK for you to take a look and see what these cool/funny poses were born from. There are 12 different poses in the set and included in the set are a briefcase (with newspaper inside I have no doubt about that) and a bowler hat. I may not be accurately dressed in my rendition of the skit but it is 2018 and I am considering it an update on a classic and I will leave it at that. You can find this pose set at The Garage Sale until the 9th of June and you might want to hurry because if you wait too long you will miss it and all the silly walk fun you can have!!! As a blogger who loves fashion as it’s pretty obvious from looking at the posts on the site, one thing that I seem to enjoy the most is footwear. Most people equate women to having all these different pairs of shoes but there are guys out there (including myself) that just love different styles of shoes, boots, sandals and the like so when a blogger pack comes along and it is shoes I tend to get pretty happy about it. Native Urban has released a new pair of sneakers at the most recent and current round of Uber called the “Silhouettes Sneakers” and has 11 different color styles to choose from for single purchases but if you truly want the best for your money because you like more than one color, there is a FATPACK option which includes a HUD and allows you to color just about every part of the shoe itself so that the style choices are unlimited. That would certainly be my choice as a consumer because when it comes to shoes I hate being limited by just a certain color as I tend to coordinate my clothing off of one another so my shoes in some way match the rest of my outfit. Sizing for the “Silhouette Sneakers” include Belleza, Signature and SLink and they are available at Uber until the 23rd of June at which after that will be moved to the in-world store and marketplace locations. Most of the outfit you can see here are items I’ve already had in my closet so I am not going to really go into detail about them as well as my facial and body things because in these photos you can’t really see them as you might normally in my other works but you would be able to take a look back at the previous post before this to find out that information as well as a third of the time I don’t really change my look unless I’m blogging a new product it helps me keep an identity of sorts which I had not had a stable one for the longest time. As I approach one of my blogging goals I’ve also reached another goal that I really never considered being a possibility and that is having been a resident of the Second Life community for 8 years as of June 4th (which should be when this is posted so it’s actually my Rezz Day). I have had a lot of experiences in that time and some of them positive and some of them not so much but when I started the journey of becoming a blogger it really helped me refine my creative side that I’ve always had but could never find an outlet for. Most of the time I would celebrate this with those around me but I think much like real birthdays at a certain point you stop celebrating because it is just that time to and I’ve accepted that and it isn’t a great big deal. I’m just happy for what I do have and am able to create and make visual photographs of thoughts and ideas that interest me.